During the time of Muhammed’s death, the regions of Makran and Sindh belonged to India culturally and politically; Muslims knew the area as the frontier of al-Hind. Though the tendency is to consider Indus as the Western border of India, people from Pliny the Elder (23 – 79 C.E) to Nicolo de Conti (1385 – 1469) thought that it was Gedrosia or Makran. At this time Harsha (590 – 647 C.E.) was the ruler of Northern India; the Gupta empire had come to end following the invasion of the White Huns. While Harsha ruled over the Gangetic plain, Punjab, Gujarat, Bengal and Orissa, the other side of the modern border was ruled by the Hindu Rai dynasty with the capital in Alor (modern day Sukkur). Founded by Rai Dewaji in 485 C.E, just a decade after Rome fell to the Visigoths, the Rai kingdom extended all way from Kashmir to Makran and from the mountains of Kurdan to Karachi. Within this empire some parts of Makran was controlled by Persians and Indians alternatively. Makran was barren then, as it is now. According to Caliph Uthman, “water is scanty, dates are bad, robbers are bold; a small army would be lost there, a large army would starve”; two emperors, Alexander and Cyrus, would agree. Though mostly barren, there were few fertile areas like the Kij Valley and Buleda which had date palms and orchards. The region was important strategically since one of the major trade routes from India to Persia ran through this region; the other route was through Kabul valley. The Chinese traveler Xuanzang (Hsüan-tsang) visited the region during the time of the Rai dynasty. Makran at that time had a large Buddhist population; there were towns like Armabil which were ruled by Buddhists who were originally agents of the Rais. Xuanzang saw 80 Buddhist convents with 5000 monks, several hundred Deva temples and one temple of ‘Maheswara Deva’ which was richly adorned. Sindh too was part of al-Hind. This was a time when the Buddhist influence was strong, but was in the decline due to rise of Hinduism and the influence of the Gupta empire. By this time, according to Xuanzang , Buddhism in Sindh was in decline and Takshashila was in ruins. There was a Brahmin migration to Sindh and many cities were founded by them. Buddhists and Brahmins blended in a unique way without any dispute which the Arab invaders could exploit. The Rai dynasty which ruled for 137 years ended with the death of Rai Sahasi II in 622 C.E. It is following the death of Rai Sahasi that events get interesting. When the King was about to die, the Queen Suhandi conspired with the Brahmin minister Chach and imprisoned all the rivals to the throne. 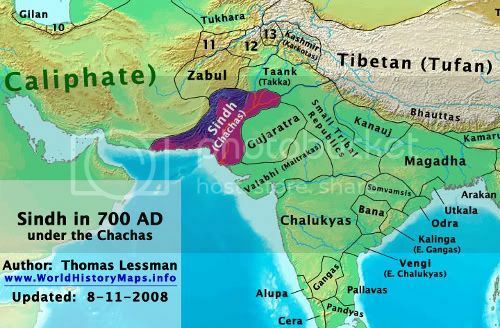 Chach became the viceroy and this started the Brahmin dynasty. The first thing that Chach did when he came to power was to put guards on the road of Makran. Meanwhile in Arabia, following the death of Muhammed, the Rashidun Caliphate, comprising the first four caliphs in Islam’s history was formed. Abu Bakr became the first Khalifa Rasul Allah (Successor of the Messenger of God) and in 634 C.E. he was succeed by Caliph Umar. It was during Umar’s time that the Arabs entered Makran resulting in the Battle of Rasil. The defeated Chach was pushed back to the Indus river. When the Caliph was asked for permission to go furthur to Sindh, he refused permission. He asked the soldiers to sell the elephants they had captured and take the money. The next caliph, Uthman, also denied permission to conquer Sindh, which eventually happened during the caliphate of Muawiya. Chach of Alor had a natural death in 671 C.E. Andre Wink, Al Hind: The Making of the Indo Islamic World, Vol. 1, Early Medieval India and the Expansion of Islam, 7th-11th Centuries, 2nd ed. (Brill Academic Publishers, 1990). Gobind Khushalani, Chachnamah Retold : An Account Of The Arab Conquest Of Sindh (Bibliophile South Asia, 2006). The year Chach took office is in dispute. According to one source it is 643 C.E. while according to one translation of Chachnama, it was 622 C.E. I get curious when I read names like “dewaji”, “sahasi” and “chach”, because I have the impression that in the period concerned, the formal names of kings were much more sanskritised (such as Rudradaman). I did a small search and the wiki article reports of a possibility that these names were a corruption of original sanskrit names: “rai dewaji” actually was “devaditya”, “sahasi”, was “Simhasena”. Unfortunately, I couldnt find “chach” in there, but I would be most interested to know what the word means. Kedar, I don’t think I saw him mentioned as anything else other than Chach. jk, what explains muslim victories during these periods – both into the east and into the west, current spain, from Arab peninsula desert, so quickly. Just religious fervour or something else? I am just starting on the Islamic history and so can’t comment on it. One thing though: If you look at the article on Rashidun Caliphate on Wikipedia, you will see lot of terriroty conquered to the West than the East. At that time the Caliphs were mostly raiding the East. I think it is a few centuries later that the Eastern empire building started.